A couple of years ago, I inquired into a few local culinary schools. It ultimately proved to be not financially feasible for me but I did notice some consistencies with each of them: One prerequisite is a safety and sanitation, which makes sense because one would need this information to competently work in a commercial kitchen. I remember being a little surprised at the time with another which is soups, stocks and sauces. As I have prepared more dishes, I have realized how fundamental the concept is. Some of my favorite dishes are seasoned simply with salt and pepper, but it's the accompanying sauce that provides depth of flavor. 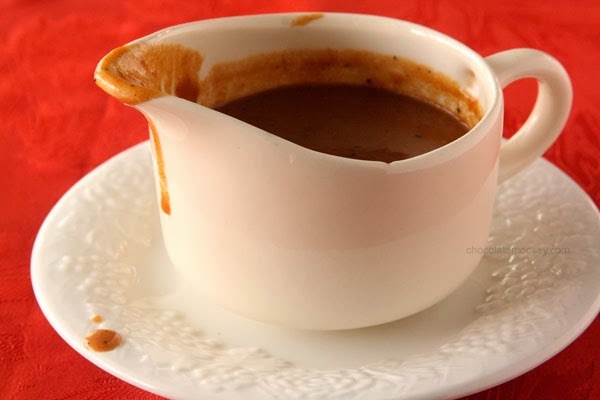 With this in mind, the team at #SundaySupper Movement has decided to further explore sauces this upcoming Sunday, the 20th, using the theme Sauce It Up. I'll be hosting again so I'd like to offer this preview of participating bloggers and their corresponding dishes. Earlier this year, I was in my local Sprouts Farmers Market when the weather was warm when I saw osso buco on sale. I didn't purchase it because I knew it had to be braised and wanted to wait for cooler weather. Ever since, I've looked whenever I went by and they hadn't had it in their bins, so when Whole Foods opened a highly anticipated location nearby a couple of weeks ago, I went and found some. I've certainly braised in the past (It's my favorite cooking method) but not this protein. Osso buco is a cross-cut section of a veal shank and is traditionally served with a saffron risotto, but saffron isn't the cheapest spice and I wanted to find an alternative. Work with a protein I'd never prepared. This Emeril Lagasse dish can be found on foodnetwork.com, but I decided to season my shanks with kosher salt and freshly ground black pepper instead of Chef Lagasse's dry rub. It's a personal preference but something called the Essence of Emeril didn't sound very appetizing. 1. Braise the shanks: Preheat the oven to 350° Fahrenheit. Heat the olive oil over medium heat in a large Dutch oven. Season the shanks with salt and pepper then dredge them in flour, shaking to remove any excess. Sear the shanks in the oil until brown on all sides, working in batches if necessary, 6 to 8 minutes per batch. Remove the shanks to a roasting pan and set aside. Add the mirepoix items (i.e. carrots, celery and onions) to the Dutch oven and cook until softened and browned, approximately 4 to 6 minutes. Season the mirepoix with the garlic, bay leaves, thyme, rosemary, salt and pepper. Deglaze the Dutch oven with the red wine, add the stock and bring to a boil. Pour the mixture over the shanks in the roasting pan, cover and place in the oven for 2 1/2 hours or until the shanks are tender. 2. Prepare the risotto: Remove the roasting pan from the oven and stir in the orzo and parsley. Recover and place back in the oven for an additional 20 minutes. Remove the pan from the oven and stir to combine, then cover and rest for 10 minutes. Serve immediately, 1 shank per person on top of a bed of orzo. Garnish with grated Parmesan and parsley. When I purchased my shanks, I chose them from the bins in the meat section. I should have spoken to the butcher at the meat counter because the shanks I purchased were too thin and the kitchen twine became loose easily so the meat fell off of the bone. The flavors of the dish were still very good but I was disappointed there wasn't much contrast in color. Lastly, my 5 year old daughter asked to photograph the dish and took the picture below. A note before I begin: I find this unusual. My experience with insurance companies has, for the most part, confirmed the stereotype that they exist solely to collect as much money as possible from their policyholders and pay out as little as they can so I appreciate this week's #SundaySupper event. For it, I was one of only twenty bloggers selected to participate in it. Well, the Sunday Supper Movement has teamed with American Family Insurance to promote their Back to the Family Dinner Table campaign. They believe in this concept so much that American Family Insurance is having a “Share Your Recipe” sweepstakes for 6 weeks with a weekly prize is a $100 Williams-Sonoma gift card plus a grand prize of a $500 Williams-Sonoma gift card. For details visit https://contests.amfam.com/familydinnertable/. AmFam have also produced a YouTube video with more information which can be viewed here. In addition, I invite you to a G+ hangout that scheduled for later today at 2PM EST with our founder, Isabel. You might be able to determine that I'm pleasantly surprised an insurance company has decided to put their money where their mouth is, so to speak to support a principle that is outside of their own profit motives. Please consider Liking them on facebook, plus following them on LinkedIn, YouTube, G+, twitter, and Pinterest. In the interest of full disclosure (if you haven't been able to tell by now), this post is sponsored by American Family Insurance. All opinions are my own. 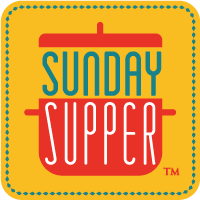 Today's theme is big Sunday supper meals that makes leftovers to be re-invented for weekday suppers. The idea for this dish was born from a comment my father made last Christmas. While my family was opening their coffee liqueurs, I was busy preparing a roast beef. While the roast was in the oven, my father remarked, "This would make great leftovers." You know what? He was correct. There wasn't much that wasn't eaten that evening, but I took a couple of portions home and ate them as sandwiches the next day or two. I was reminded of the meal when I saw a couple of roast chickens featured this week and thought this concept would be perfect. I'd advise to plan for leftovers, purchasing something that is versatile so it can easily be reinvented later. For example, leftovers in this case could be used to make fajitas, a French dip sandwich, or stroganoff. Prepare a dinner so that the leftovers can easily be repurposed into quick weekday meals. I used the rub ingredients from page 55 of the recipe guide of Top Chef University DVD set, but the dish there uses a standing rib roast with potatoes so I used the method from the roast I prepared last Christmas which can be found on Food & Wine's website. 1. Arrange your oven so your roasting pan will be in the lower one-third of the oven. Preheat the oven to 375° Fahrenheit. 2. Complete the mise en place: Combine the sage, thyme, rosemary, parsley, salt, pepper and olive oil in a food processor and pulse until it forms a coarse paste. Place the roast on a rack in a large deep roasting pan. 3. Cook the roast: Slather the herb rub onto the top and sides of the roast and place in the oven until the internal temperature in the center reaches 125° Fahrenheit, approximately 2 hours. Once completed, transfer the beef from the pan to a cutting board. Tent the roast with aluminum foil and let it rest for 20 minutes. To serve, thinly slice the roast across the grain and place on a platter. I reduced the salt in the herb paste by half, but the roast was still well seasoned. Mrs. Stuntman was also surprised the roast was so juicy. We ultimately used the leftovers for sandwiches. Before I proceed, I have a confession. If you're a regular reader here, you know that one theme consistent throughout this website is me taking myself out of my comfort zone in an effort to learn something. Well, when I announced that I'd dedicate September to desserts, I never felt so out of place. A contributing factor in the number of dishes I produced is insufficient planning on my part, so I must apologize. Now that I have an ice cream machine, I'll publish one as I see fit. Last week Mrs. Stuntman purchased a ham for our family that was rather large so I have been looking at recipes for leftovers, which is how this dish came about. I might equate this to a challenge on Chopped in trying to piece together a dish from odd ingredients. I like this dish from a conceptual standpoint because it's a creative way to use a Mornay sauce which is a derivative of a béchamel sauce. You might recognize a Mornay because it's a component of a Hot Brown sandwich and a macaroni and cheese. I used a recipe from Taste of Home's website. 1. Prepare the base: combine potatoes, water, onions, and carrots in a saucepan. Bring to a boil, cover and reduce to a simmer and cook until the vegetables are tender, approximately 10 to 15 minutes. 2. Prepare the Mornay and finish the dish: While the vegetables are simmering, melt butter in a second saucepan. Create a roux by stirring in the flour and stir until smooth. Gradually add the milk then season with salt and pepper. Bring the béchamel to a boil and stir until thickened, approximately 2 minutes. Add the cheese and stir to melt. Add the Mornay to the undrained vegetables and then add the ham and peas. Serve immediately in warmed bowls, garnished with crackers and parsley. This dish would be perfect for a cold winter evening because it was a little rich, but the sweetness of the carrots balanced the saltiness of the ham well. I classified this dish a Light Stunt (appropriate for a weeknight) because I was able to finish cooking the dish in about 20 minutes, but please keep in mind that the mise en place is a little labor intensive.